Patients suffering from atrial fibrillation (AF) have a minimally-invasive curative treatment option thanks to advancements in cardiac ablation catheter technology. The use of one such advancement, the steerable sheath, has resulted in higher clinical success rates in comparison to using a traditional fixed sheath.1 But despite its clinical success, operating the steerable sheath has its challenges, such as knowing a sheath’s position when under fluoroscopy. In an effort to anticipate clinicians’ needs, Merit Medical has designed a procedural solution called the HeartSpan® Steerable Sheath. It allows a clinician to move the distal tip from 0° and 180° to achieve the desired curve within the atrial chamber. Unlike any other steerable sheath on the market, the HeartSpan facilitates catheter navigation by offering a Neutral Position Indicator and a tactile click at the neutral position. For ease of use, its ergonomic handle displays two arrows that indicate the directional plane of the curve as the handle turns. 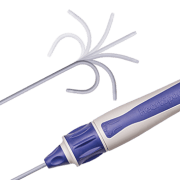 Reaching the desired catheter position by way of a steerable sheath has been shown to have several benefits. A randomized controlled study by Piorkowski et al. investigated the clinical outcomes of using a steerable sheath in comparison to a fixed sheath.1 The study prospectively included 130 patients with paroxysmal or persistent drug-refractory AF undergoing interventional cardiac ablation for the first time. Results published in Circulation Arrhythmia and Electrophysiology showed that single procedure success was significantly higher in patients ablated with a steerable sheath (78% vs. 55% after 3 months; 76% vs. 53% after 6 months).1 Additionally, fluoroscopy time was lower in the steerable sheath group (33+/-14min vs. 45+/-17min). The authors concluded that using a steerable sheath improved catheter stability and catheter-to-tissue contact when compared to the traditional fixed sheath. In addition to the Neutral Position Indicator, the HeartSpan has other state-of-the-art features that support procedural success. For navigating anatomical variations, the HeartSpan is available in three curl sizes. Its braided construction offers kink resistance and curve durability. A lower crossing profile enables seamless dilator to sheath transition for smooth advancement across the atrial septum. Radiopaque marker bands enhance visibility, and an atraumatic tip reduces the risk of atrial wall perforation. The HeartSpan’s shaft body is smooth and lubricious for easy vessel insertion. Contact your Merit Representative for a clinical evaluation. Because when it comes to cardiac ablation catheters, you should always know your direction. Piorkowski, C., Eitel, C., Rolf, S. et al. (2011). Steerable versus non-steerable sheath technology in atrial fibrillation ablation: a prospective randomized study. Circ Arrhythm Electrophysiol, Apr; 4(2): 157-65.